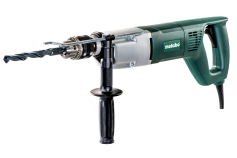 Since in 1924 the "Metallbohrdreher" (metal drill) gave the company its name, Metabo has been continuously implementing new standards when it comes to drilling. The high quality standards guarantee optimum work results and precise holes. 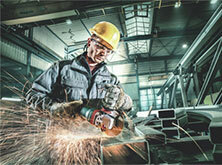 Every material has different requirements in terms of drill speed, torque, speed and the drill. 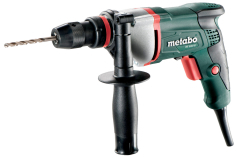 Metabo offers the right drill including accessories for any challenge. 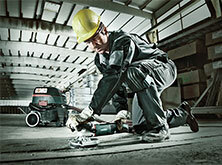 From the small bench tool to the 1,800 Watt three-speed drill Metabo offers a wide range of drills. 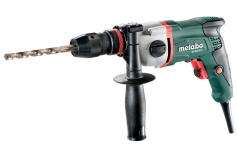 Metabo also offers a cordless drill, the BE 18 LTX and an air drill DB 10. 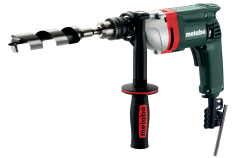 Whether in metal, construction of woodcraft trade, in steel or mechanical engineering or in the metal-processing industry: Any drill from Metabo is perfectly adapted to your requirements. For holes with smaller diameters in wood and metal, the small, light bench drills with 450 Watt are ideally suited. They have an infinite speed regulation to that you can match the speed to any material. The compact drills with 500 and 600 Watt have been developed especially for demanding metal processing in trade and industry. Each of them has an optimal speed range for particular drill diameters in steel. All have an die-cast aluminium gear housing that ideally dissipates the head and is robust at the same time. The BE 500/6, the BE 500/10 and the BE 600/13-2 drill are equipped with a high-quality Futuro Top keyless chuck from Metabo that automatically retightenes when drilling and thus ensures precise drilling results. Drilling near walls is possible without any problems thanks to the compact design with with small dimension across corners. 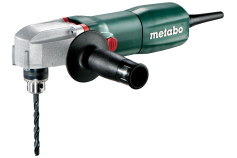 Metabo drills from 750 Watt to 850 Watt come with different equipment features and can be used for drilling in steel up to 16 mm and in wood up to 50 mm diameter. The 1,300 Watt drill BEV 1300-2 has a two-speed gearbox and constant electronics for constant speeds even under load for particularly fast drilling progress. 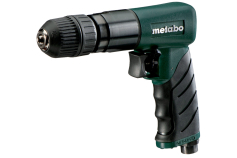 Further special features of Metabo can be found in the product descriptions. In hard-to-reach areas it is often difficult to work with drills. 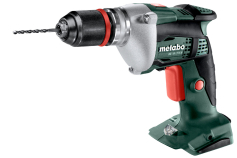 The Metabo angle drill WBE 700 angle drill with 700 Watt can be used here. Thanks to its special design and the robust angular gear it is the expert when it gets too tight for other drills. Another specialist is the three-speed drill B 32/3. It can effect bores into wood up to 70 mm and into steel up to 32 mm diameter. It can also be used in combination with the magnetic drill stand M 100 and thus work like a magnetic core drill. Matching any drill, Metabo offers an extensive range of system accessories, such as different chucks, wood drill bits, metal drill bits, hole saws, angle and torque setting adapters, drill stands, steel wire brushes, all-purpose vacuum cleaners, suction adapters and much more.